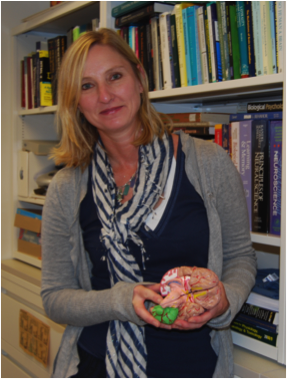 Our lab focuses on studying the underlying causes of impairments in language development (including reading skills) by looking at how candidate “risk factors” alter brain development and behavioral outcomes. These kinds of research questions are very difficult to address through exclusively human research. This is because most diagnoses of reading disability and/or “dyslexia” are made well after the early foundations of neural circuitry in the growing brain have been established. At that point, neuroimaging can characterize differences or problems in how the brain operates – but cannot go “back in time” to look at early events that led to these atypical patterns of function. On the other side, infants who may be at risk have not yet been identified, since the emergent indices of language do not even begin until first words are spoken (around 1 year of age) – and most diagnoses of language problems occur much later than that. 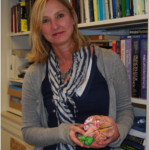 Using animal models, however, we can experimentally examine and manipulate some of the critical variables, and carefully measure and quantify changes in the brain and in later behavior, starting from the earliest steps in brain development. Some of these “key” variables include mutations of genes that have been linked to dyslexia and/or related developmental language disorders. 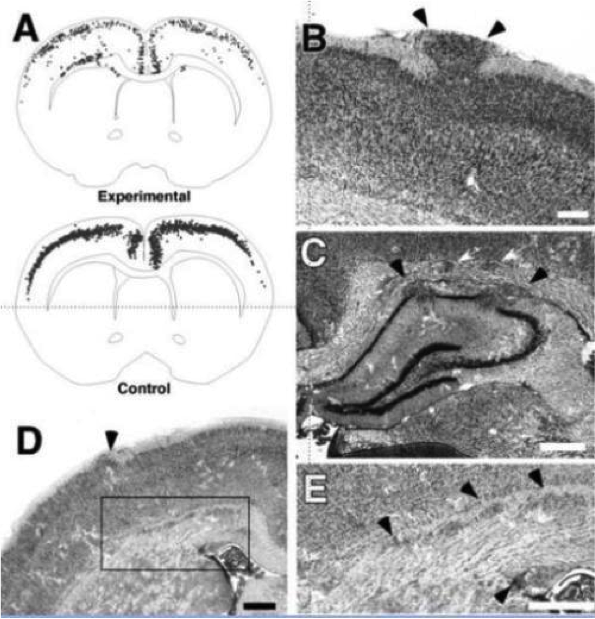 (Perhaps surprisingly, all of the genes that have been identified to date as “risk factors” for dyslexia have near-identical “homologs” (or counterparts) in rodents – meaning that the underlying bases for these developmental problems likely have their roots in very basic aspects of brain circuitry and information processing). Such studies have revealed that genes that show mutations at a higher than chance level among diagnosed populations are (for the most part) also key players in early brain development. Moreover, our rodent studies (using both rats and mice) have shown that disruptions to these genes can lead to behavioral changes that could very well underlie reading problems in human beings. 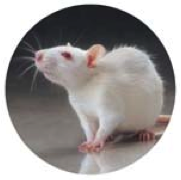 What kind of behaviors can one possibly examine in rodents that are relevant to reading? It turns out that a great many “basic” processes provide the scaffolding upon which language skills are built. And evidence suggests that problems with these more basic skills could cascade into language and reading. One example is the ability to process, identify and discriminate very rapidly changing acoustic information – a skill needed for the most basic speech processing (e.g., knowing “baba” from “papa”). Difficulties at this level can cascade into phonology, the sound-meaning system of language – an area where core difficulties associated with language and reading difficulties are consistently identified. Another skill is working memory – the ability to “hold onto” information while a word, sentence, or paragraph is completed. It turns out that rats and mice can typically perform these basic functions – distinguishing and responding to different sounds, remembering things they have learned[PMc1] — very well, and therefore we can detect when they have difficulty! Such studies have revealed that, in fact, changes (mutations/deletions/disruptions) to genes implicated in dyslexia can lead to significant problems with these functions. Moreover, different genes may be associated with different problems. This means that someday, early genetic screening might help [PMc2] us in identifying or predicting specific kinds of reading impairment even before the problems start! And such assessments might also assist in selecting the most optimal remediation/intervention strategies. Szalkowski, C.E., & Fitch, R.H. 2012. Candidate dyslexia susceptibility genes and disorders of neuronal migration: Behavioral effects of cortical dysgenesis in a rodent model. In Neuronal Migration: Disorders, Genetic Factors and Treatment Options, (Eds. Girard, A. & Moreau, L.), Nova Science Publishers. P. 29 – 50. Fitch, R.H. & Szalkowski, C.E. 2012. Using animal models to dissociate genetic, neural, and behavioral contributors to language disability. In Developmental dyslexia: Early precursors, neurobehavioral markers, and biological substrates. Benasich, A.A. & Fitch, R.H. (Eds.) Brooke’s Publishing, Baltimore, MD. P. 172 – 190. Research supported by NIH grant number HD20806, and by internal funding from the University of Connecticut.